We're having one of those low season "weather fronts" at the moment. Sometimes it's lovely weather, sometimes it's not bad, and every few weeks we get periods of rain, wind and grey skies that normally last about 3 days. If you are here for 3 days right now... oh dear. If you're coming on Saturday, should be OK. But no promises! We had some rain on Tuesday evening. I got a tiny bit wet riding home, then there was some heavier rain overnight. It had also rained on Monday night, but not on our house. 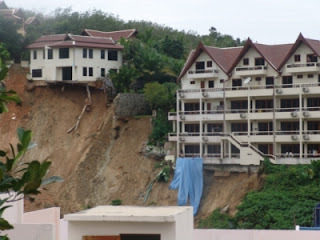 However, in Patong (just 7 or 8km away) there was rain, and in the hills where building never stops (hey, everyone wants a seaview) there was a small landslide on Tuesday morning which buried 3 Burmese workers. It's happened before. A couple of buildings were close to collapse last year in the hills above Patong, though nobody was killed that time - see photo below, and story here: Don't Mess with Mother Nature. It's a problem that looks set to continue. Building codes? Safety? Profit? Does anyone really care about Burmese labourers? 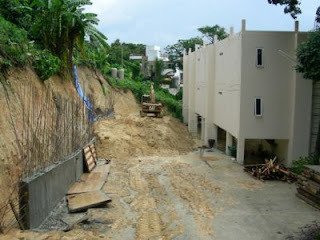 Here's my advice... if you want to buy a house in Phuket, be sure it's checked out by a real professional if you're looking at seaview houses built on hillsides. My house is on flat land and not right under a mountain! Last night's rain was heavy. We just got builders in to seal and repaint our roof last week and looks like there's no leak now, hooray! If you're in Phuket today, I reckon you might want to check out the Central Festival mall! From yon far country blows. What spires, what farms are those?